MU Welcomes Freshmen During Tiger Walk, Announces Record Enrollment for 2012 Fall Semester from MU News Bureau on Vimeo. COLUMBIA, Mo. – It’s evident that the lazy days of summertime are over as Columbia’s population jumped by more than 34,000 over the weekend. Today, the University of Missouri family welcomed 900 more students to campus compared to this time last year. 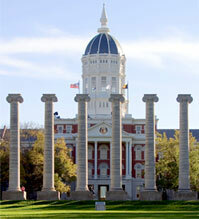 Mizzou set another record in total enrollment, 34,255, up 937 students compared to the first day of school last year. The number of minority students and freshmen also increased. The number of minority students rose this year as 4,940 minority students were enrolled compared to 4,480 last year, an increase of 10.3 percent. The number of African-American students rose by 7.8 percent to 2,404, and the number of Hispanic students rose by 10.5 percent to 975. The number of Bright Flight students, one measure of quality of the freshman class, rose by 9.4 percent. This year’s mean ACT score of 25.7 remained the same as last fall. In comparison, students across the state of Missouri averaged 21.6 on their ACT, and students throughout the nation had an average score of 21.1 on the ACT. “These incoming students can expect a successful experience at Mizzou given that our graduation rate is now 70.7 percent, which is the highest in our history,” Korschgen said. MU officials also are experiencing more demand in the number of online courses taken through the university. Today, 3,659 students are enrolled in one or more courses taught completely online. EDITOR’S NOTE: Please see table below. Official enrollment figures will be available after the 20th day of classes.